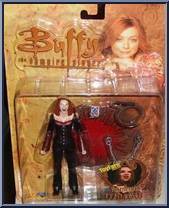 This Buffy Hemery High Cheerleader figure is packaged in a baggie, and was given away at the 2006 Toy Fair by Time and Space toys. 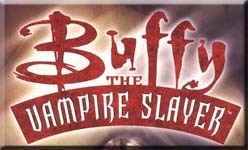 It's also available from the Buffy Collector's club at Time and Space. . .
From the season 1 episode of "Nightmares". Re-Issue of Moore's original figure. This one include's a removable bunny suit with fully dressed Anya figure underneath, Anya's amulet, bunny, and Magic Box floor base. Season 4, episode "Fear I. . .
From season 4, episode "A New Man". 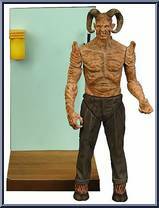 Only available to select retailers at the 2005 International Toy Fair in New York, and in a limited number to Time & Space Toys for their Buffy Collector Club. Could only be obtained by getting a very rare redemption card in packs of Buffy Women of Sunnydale trading cards. These cards were only found 1 in every 432 packs. Benson Entertainment teamed up with Diamond Select Toys, producing an exclusive paint job of "Triangle Tara" Action Figure as a fundraising event for film production. It's limited to 2000 wo. . . Season 5 Willow with variant exclusive Manora tee-shirt, comes in a baggie. Limited to just 995 total pieces. White window box packaging. Willow comes dressed exclusively in a "Dingoes Ate My Baby" band tour T-shirt (the name of Oz's band), and packaged in a baggie. Released only as a New York Comic Con convention exclusive and limited to only 1500 pieces. However, 500 pieces of those were signed by Nicholas Brendon himself. From season 3, episode "The Wish".